Just a slight diversion before we jump back into the Jonah Hex books. Marvel Premiere was Marvel's answer to DC's Showcase, a series of one-shots to see what would work and what. 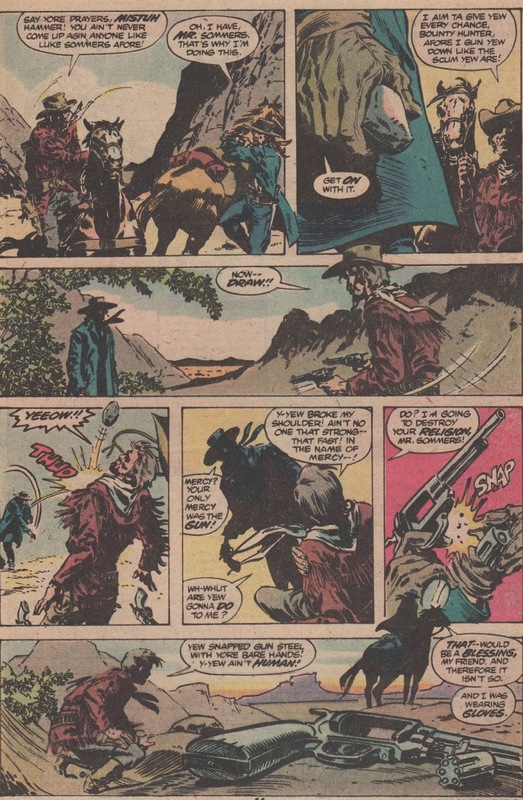 In 1980 they produced this western, written by Peter B. Gillis, penciled by Gene Day, and inked by Tony DeZuniga. Here the, is the story of Caleb Hammer. Our story starts in 1890, in Manacle, Wyoming. A young buck walks up to a man in a bar and calls him out. The young man draws and the man, Caleb Hammer, rushes him and knocks him clean out, tossing him into the street. The sheriff comes by, wanting to know what is going on. Hammer explains that he is with the Pinkertons and that he is looking for two men, Crawford McKie and Jake Lovelace. They took part in the campaign to capture Geronimo but after that they took up bank robbery, murder, and other things. The sheriff explains that they did come through, but Manacle wasn't worth their time and they moved on, up in the valley. The sheriff offers Hammer a drink, but he declines and moving on. In the morning, Hammer is riding into the valley when the youngster that he trounced the night before comes riding up, saying Hammer won't get away with treating him that way. FLASHBACK: 1885. A Union soldier storms into a woman's bedroom, calling her Molly. The woman isn't Molly and the soldier shoots her dead, claiming that she cheated on him. A crowd gathers and Hammer is among them. He realizes that his wife has been killed and the soldier, drunk out of his mind, starts shouting that he had the wrong hotel room. Hammer had been training for the ministry and his faith has abandoned him. Present day: The young gun demands his chance to have revenge. Hammer dismounts, picking up a fist-sized stone. The young gun jumps off his horse and draws on Hammer, who responds with throwing the stone into the young man's shoulder, breaking it. The man goes down and Hammer walks over, picks up his pistols and snaps the cylinders off and rides off. Night falls and Hammer comes upon a ranch, having followed the outlaws trail. The cabin shows signs of a struggle and when he checks the barn, he snags his boot on a tripwire and the barn explodes, he manages to grab a colt and rescue it from the flames. FLASHBACK: 1886, the McCormick Harvesting Machine factory in Chicago, Illinois. There is a union strike and as scabs try to cross the picket line a fight breaks out and six men are killed in the riot. One of them is Isaak Hammer, Caleb's younger brother. Caleb was visiting his brother to get over his wife's death, but once again his faith crushed him. Present day: Hammer notices that there is a cabin on the cliff overlooking the ranch he just found. He spots a reflection from inside the cabin and realizes that his prey is up there, watching the burning barn. Inside the cabin, Crawford and Jake are sure that 'the Pinkerton' is dead, but just in case, they still have the ranch family as hostages. Nora, the wife, has had enough and demands to be let go because Jimmy has 'got himself a sickness'. The crooks ignore her. Outside the cabin, Hammer gets closer and realizes the cabin sits on The Devil's Anvil, a solid piece of rock outcropping that offers no cover whatsoever. Hammer realizes that the only weapon that he has is..... fear. He puts his hands near his mouth and start howling like a wolf. In the cabin, Crawford gets a little spooked but the rancher explains that there are no wolves. It must be the Indian wolf-spirit whose lands they have defiled. Just then they look out the window and spot Hammer outlined against the full moon, his arms raised and draped in some cloth. Just as quickly he vanishes. FLASHBACK: 1888, Montana. Hammer bursts into a cabin to bring in an outlaw and ends up shooting the man in the shoulder but a huge snowstorm moves in and they are snowed in for five months. Sadly, the shot man dies and when Hammer leaves the cabin he is a man completely devoid of any faith at all. Present day: The rancher explains that the Devil's Anvil was an Indian holy place and the two crooks actually helped capture Geronimo. The Wolf-Spirit wants to punish them for that. Hammer pulls his ghost stunt once more and the crooks are getting more and more edgy, starting to believe the rancher. Just then Jimmy falls to the floor in convulsions and one of the crooks takes that as evidence of the wolf-spirit trying to get into the cabin. He lets loose with a barrage of bullets, killing teh boy just as Hammer kicks in the door. He punches the crooks senseless as one of them starts screaming that it was the wolf-spirit that was trying to get them. It is then that Caleb Hammer realizes that it was the fear that HE instilled in the crooks that led them to kill Jimmy. Hammer picks up the boy's body and takes him outside...to look at the stars. Thirty four years ago I loved the heck outta this book. 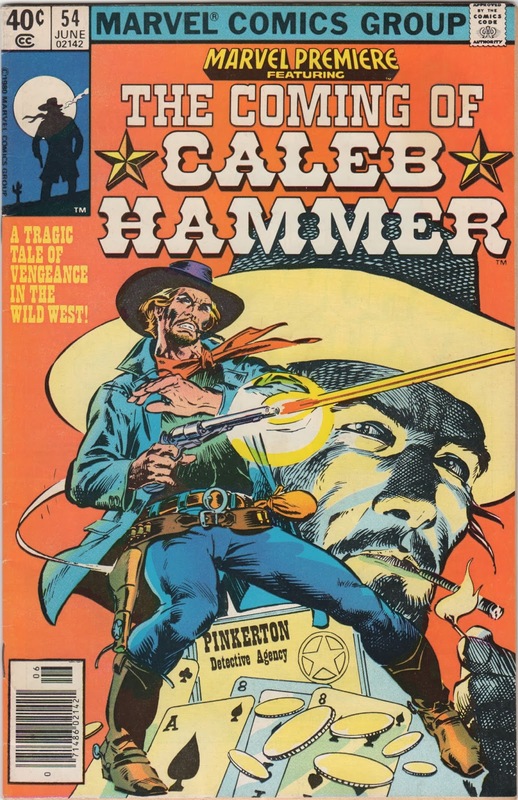 Re-reading it, Marvel was doing their spin on Jonah Hex with some slight twists (unscarred, not a bounty hunter). Caleb Hammer was a man whose life was full of tragedy but he didn't turn to booze and he didn't shoot to kill. He just turned his back on God and busted guns with his bare hands. 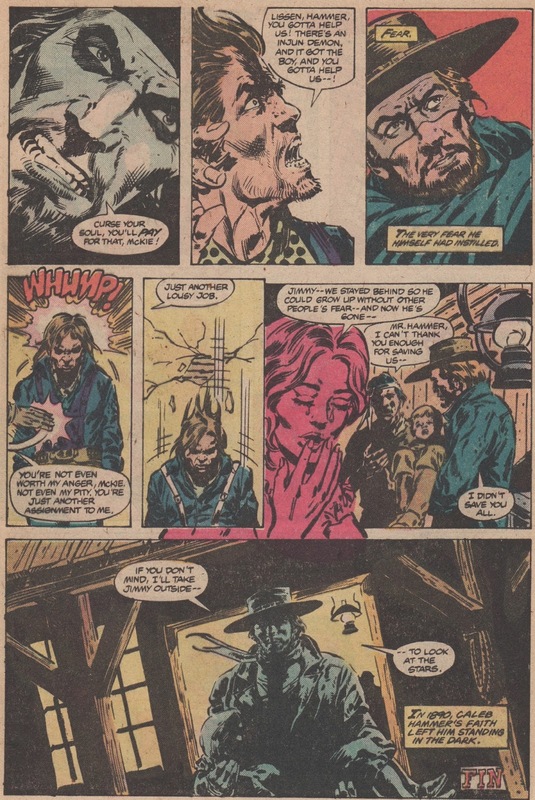 Of course, Marvel got DeZuniga to do the inks so that it would even LOOK like a Jonah Hex book. I can understand why this never took off, the Western was pretty much dead at this point except for Jonah and he only had five years left as a Western himself. It would be fun for Justin and Jimmy to 'borrow' this character from Marvel and clash with Hex once he gets back to his own time. All Star Western, A brief look. You may know this about me from prior postings, you may not. Since I have been resurrected and once again find myself perched in front of a keyboard, I shall repeat myself. Jonah Hex, for me, was never really part of the Detective Comics Universe. Jonah was born out of Weird ___________ Comics, that red-headed left handed step-child of the 70's. He wasn't the good guy western and he took a lot of the western tropes and subjugated them and then he did the same with comic book tropes ("Death of a Bounty Hunter", anyone?). I think that Super-Spectacular was the first time I ever teared up reading a comic (except maybe from laughing at Uncle Scrooge comics). Then Jonah showed up in Justice League of America and if you ever want to see an abomination against nature, just pick up those two lovely books. The next time he showed up in JLA it was the heroes that were stomping on HIS turf, so it wasn't AS bad. Jonah then got tossed into the future and there were the 'cross-overs' with 'Batman' and the SUPER SPECIAL GUEST APPEARANCE of the Legion of Superheroes. I went along for the ride because it was Jonah Hex and Jonah in the future is more interesting than a comic with no Jonah in it whatsoever. Of course, at the end of that run, a tear stained my cheek. Fleisher could write tragedies like nobody's business (but I must mention that Jonah Hex Vol #50 was another tearjerker for me). And then we come to the Vertigo Hex. Ahhh, yes. Vertigo Hex, the Hex that proved that the JLA stories weren't the negative apex of Hex story telling. Vertigo Hex, that which spawned the sword weilding Heroclix figure. Vertigo Hex, that which stoked the twisted fever dreams of Neveldine and Taylor and spat upon our summer cinema hopes like my great-grandma unleashing her chaw upon the shoes of an unwanted salesman. Every time that Jonah would be tossed into a story (Kents, Swamp Thing, The Return of Bruce Wayne, Generations) it was always because someone said "Western? Let's toss in Jonah Hex, the fanboys will love that!" and I would grit my teeth, buy it, and tell myself that this was an alternate universe Hex. I could understand Hex in 2050, but Hex hanging out and talking gritty with superheroes? Nahhhh, it wasn't for me. Rocket forward to All Star Western. Hex in Gotham. Weeeeellllllllll, I can kinda suspend my disbelief. It had more of a Wild Wild West feel (the series, not the movie) to it and there were Easter eggs for the superhero fanboys this time. Overall the story telling was solid and things went along pretty well. And then, Vandal Savage. errrrrr, OK, I guess. Jekyll and Hyde and Eclipso's diamond? Seemed to be just another throwaway story as part of a VAST CROSSOVER EVENT. Meh. Which brings us to Booster Gold..... Booster Gold. I liked Booster in his own book (the most recent series) but for Booster to be in Jonah Hex's old west was too much for me. But I continued to buy it because it was Jonah Hex, but MORE importantly, it was Palmiotti and Gray Jonah Hex. Booster being Booster, Jonah ends up in present day and has run-ins with Batman-clone, Bruce Wayne, Constantine, Swamp Thing and finally Superman. But let's get to the musem, shall we? Sadly, I only pick up my books (two of them. Jonah and Afterlife with Archie) based on whenever I can get to the comic store and thanks to everyone on Facebook, ended up knowing of the main display in the museum. The whole museum made me smile. We had the nice nod to Tony DeZuniga as the collector of memorabilia and we saw Jimmy (and I think that was Justin) walking around the exhibit. On a side note, that docent, whom I imagined in my mind was named Dwayne, didn't look like me whatsoever. Oh, well. But back to the story. This issue was the highlight of the series for me so far based purely on the conversation with Supes, the Museum, and the Aftermath. The Aftermath. I capitalize it because it deserves it. The panel with Hex riding into the oncoming light while calling Tallulah's name... my stomach was in knots as I turned the page, knowing, yet dreading what was coming. And there is was. The marks on the road, the smashed bike, and finally Hex's crumpled body on the asphalt. We know that Jonah lives and we know that he gets back to his own time (I've seen the solicit for #30), but it is HOW he lives and how he gets back that will be the interesting part. I know I'm being selfish, but I hope when he comes back to the Old West, it's more devoid of the DC Universe than what we have been seeing. I'll be back next week, trying to pick up where I left off in reviewing Jonah Hex Vol 2. Until then, you kids stay offa my lawn. There have been rumors, but I am not dead. Tuesday I will be back in the saddle and on the keyboard talking about All-Star Western, Hex, and other stuff.